This season sees the Minnesota Vikings playing out of TCF Bank Stadium while their new stadium is being built on the site of the Metrodome. 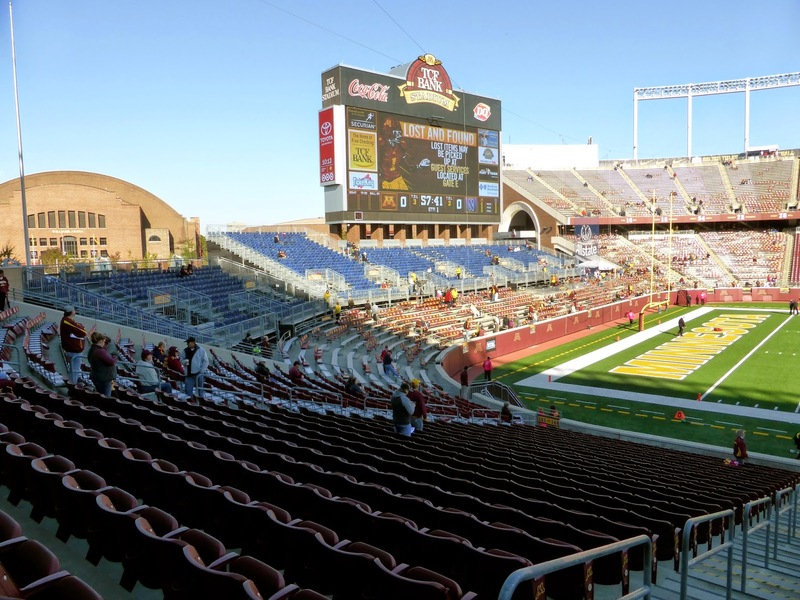 TCF Bank Stadium is the relatively new home of the Big Ten's University of Minnesota Golden Gophers, having been opened in 2009. As part of Club 122, I would have to revisit the Twin Cities to see this temporary venue. The key was finding the best weekend for sports. 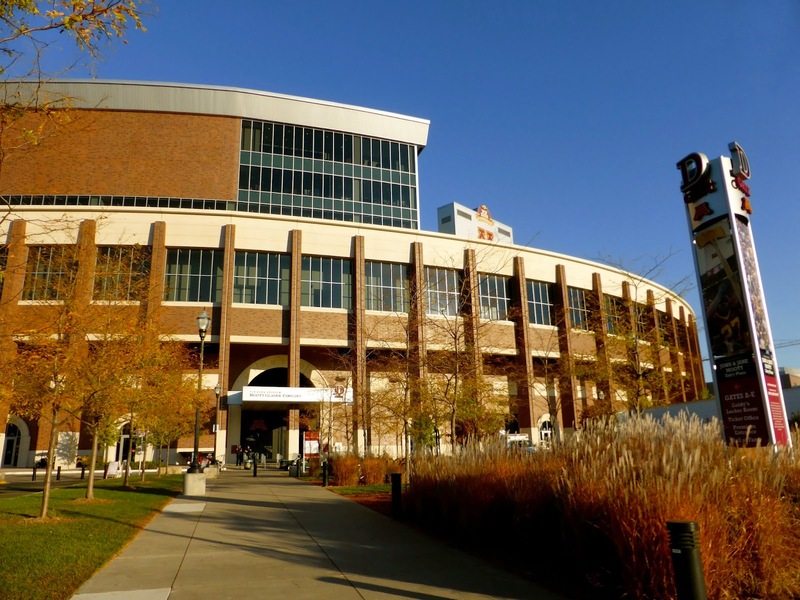 The Wild recently opened their NHL season, and there are a couple of weekends when they are home on a Saturday night before the Vikings play on Sunday, but both of those are in the winter, when weather can wreak havoc with weekend travel plans and outdoor games can be a bitter experience. 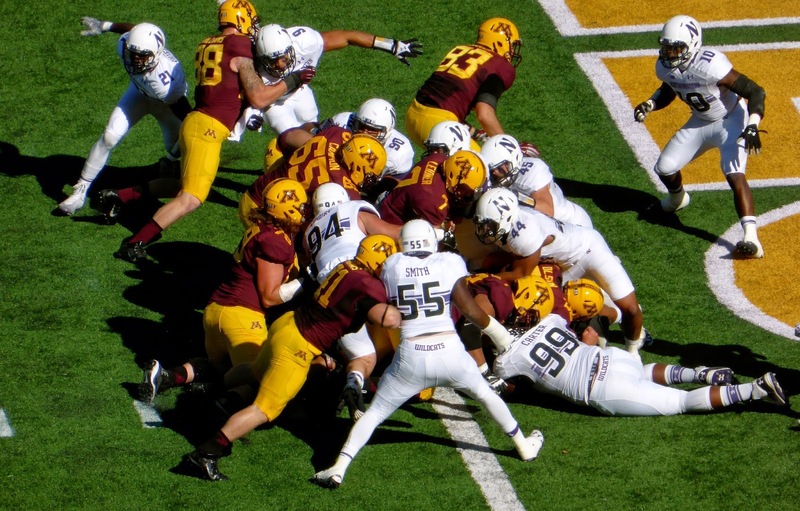 My friend Eddie suggested Columbus Day weekend, as the Golden Gophers were home on the Saturday. I had yet to see a Big 10 football game, and with Monday being a holiday for me, that was obviously the better option. Saturday was a picture perfect fall day, with temps just above freezing as we arrived at the stadium at 8:30 for the 11 a.m. start. Parking was $30 a block from the stadium but that came with $20 for coupons at the bar next door, so not a bad deal. Those on a budget can find free street parking a few blocks away. 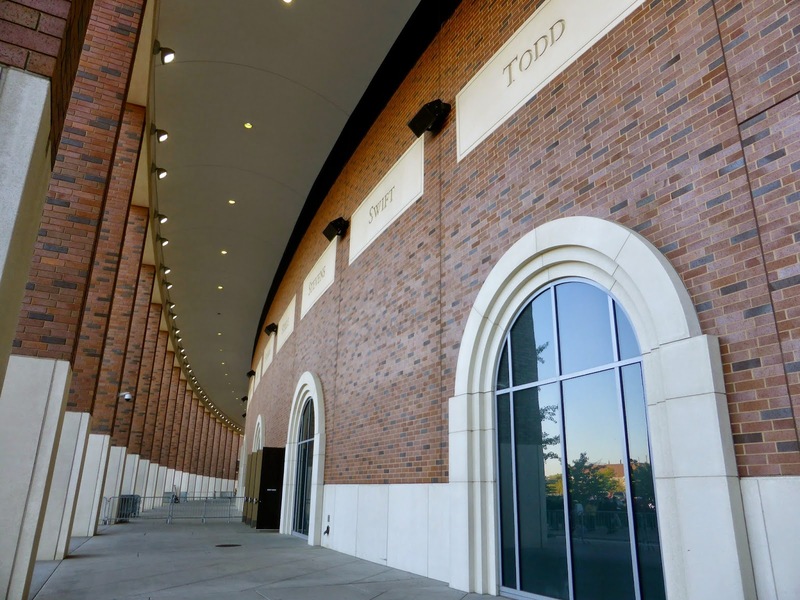 TCF Bank Stadium reminded me a bit of Lambeau Field in its exterior design, not tall and encircled by windows along the top. It is still bright and shiny, and you should walk around, taking note that each Minnesota county is honoured by being cast in stone that is inlaid in the bricks as you can see below. It is actually quite an impressive sight. Tickets were $50 at the window for upper deck seats, although we probably could have done better with the scalpers. The stadium is relatively small, with no suites separating the upper and lower bowls, so there are no bad seats in the place. The corners on both levels are benches, as are the east end zone seats. but they do rent seat backs if you need one. The west end zone is temporary seating necessitated by the Vikings, with the large scoreboard just above. My favourite part though is the maroon seats with gold seats interspersed to spell Minnesota with a giant upside down W on the lower level. The single concourse is more than spacious enough for the 50,000 or so fans that are in attendance. Food options include some that are not found elsewhere, including a bread bowl with stew for $5.50 that is more bread than stew but still worth the price. I recommend checking out the portable stands in the horseshoe area on the west side of the stadium, where you can get burnt ends from Dave’s BBQ ($9) or a cup of chili from Jax’s for $6, both of which are good options on a cold morning. Beer is also available, with many fans partaking local lager Grain Belt while Miller Lite was the swill on offer. 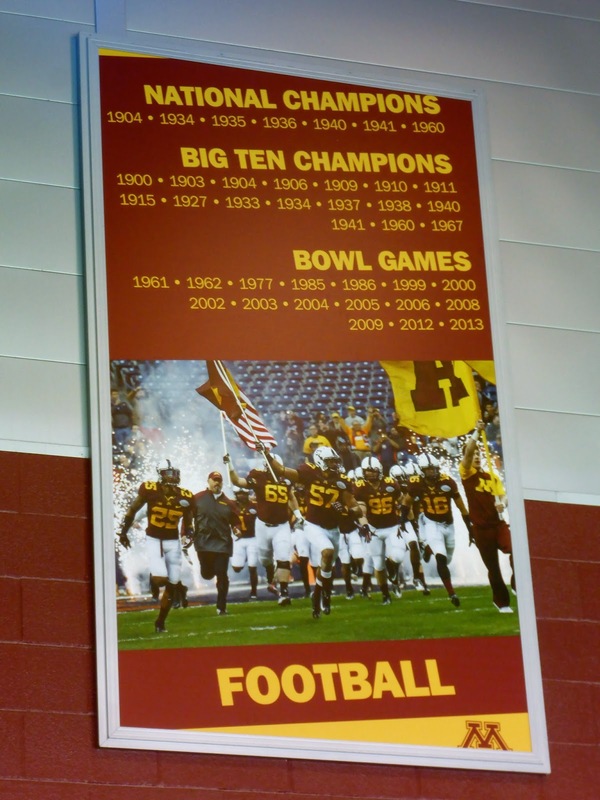 TCF Bank Stadium includes posters high on the wall celebrating the university’s many successful sports teams. Football has seven national championships, but the last came in 1947. Their last Big 10 title was in 1967, so their futility equals that of the Maple Leafs. Could this be the year both end 48 years of frustration? There is also a Hall of Fame but it was not open to the public either time I went to check it out. There are a lot of private parties at the bars around the stadium, which is one of the better campus neighborhoods I have seen, with the Big 10 sports bar on Washington Avenue offering a good breakfast with $3.75 tall boys of PBR to get you ready for the game. 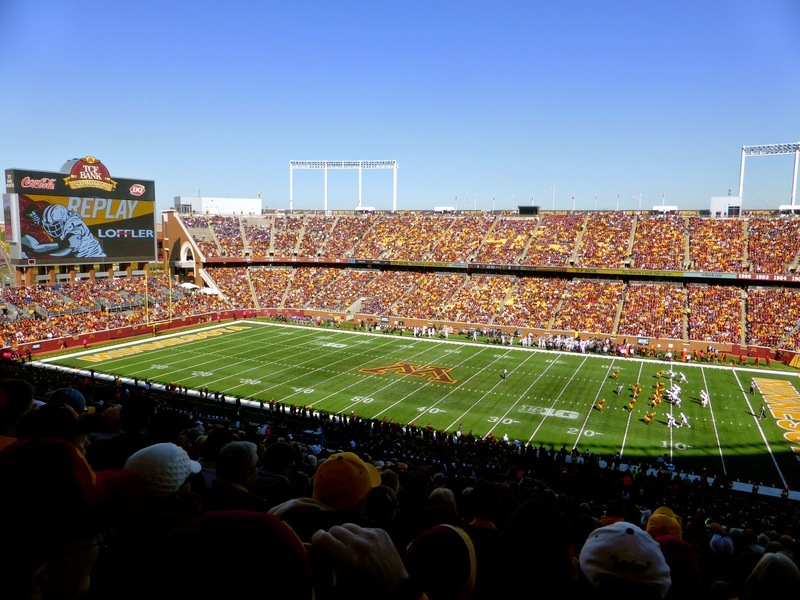 All in all, a Golden Gopher football game in October is tough to beat for a sports traveler. It is a Power 5 conference without the Power 5 hype. The stadium is new and properly designed; they didn’t try to add all the bells and whistles that many new venues feel are necessary but end up detracting from the experience. 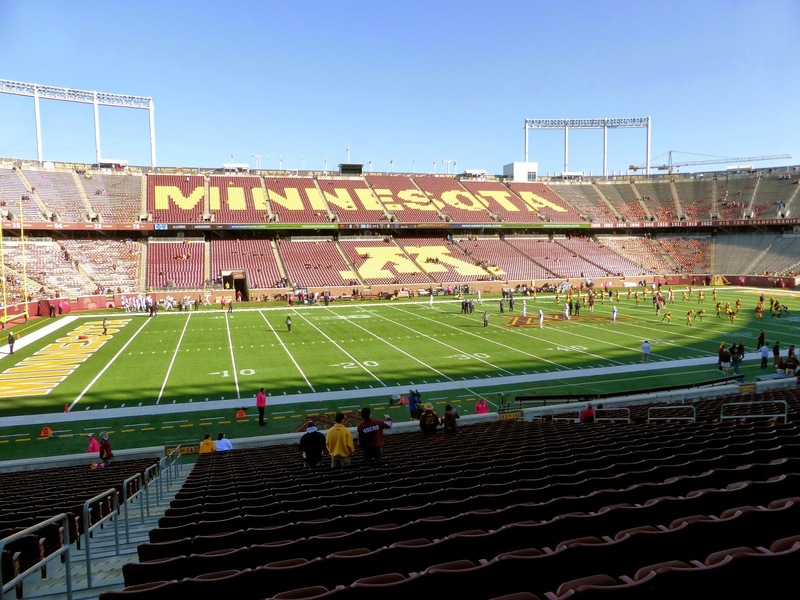 This was the only weekend this season when both the Gophers and Vikings played at TCF Bank Stadium, so if you want to see both on one trip, wait for 2015. But if you can only see one, I recommend the college team here; it is just a more enjoyable experience. The Northwestern Wildcats were the visitors, coming in at 3-2 (1-1 Big Ten) while the Golden Gophers were 4-1 (1-0 Big Ten). 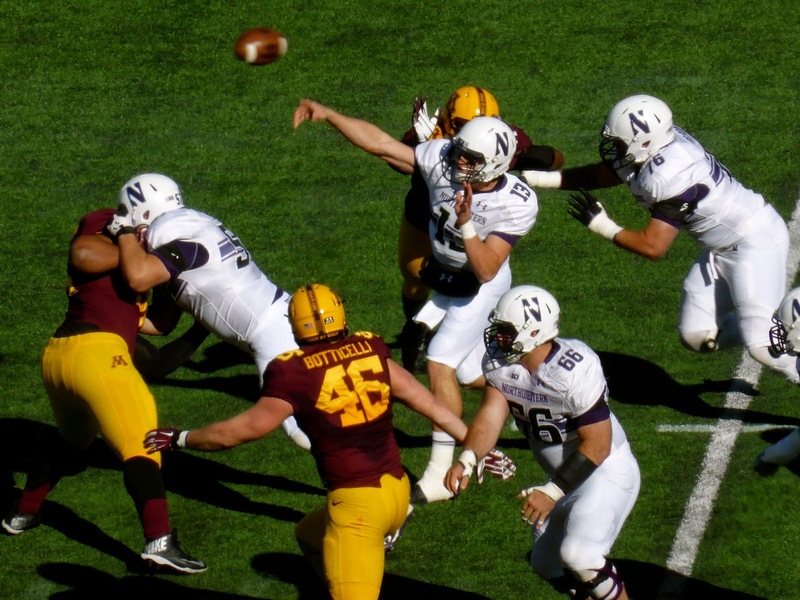 This was a throwback affair with Minnesota running the football 39 times to only 15 passes, while Northwestern kept the ball on the ground for 34 plays, but passed 50 times. The teams exchanged scores, with Minnesota QB Mitch Leidner scoring twice on sneaks from the 1 (he’s #7 above crossing the goal line) while Justin Jackson (below being tripped up) scored on an 11-yard pass from Trevor Siemian. The Wildcats added a field goal to end the half down 14-10. The third quarter was scoreless as defense dominated, and when Minnesota kicked a field goal early in the fourth, it looked like that might be enough especially after Solomon Vault muffed the ensuing kickoff and the ball tumbled out of bounds at the 3-yard line. But Northwestern was not perturbed, and calmly marched 97 yards on 13 plays, with Siemian (throwing below) scoring from 2 yards out to tie the game at 17. Overtime was in prospect for about 13 seconds. That is how long it took Jalen Myrick to return the kickoff 100 yards for the home team, sending the crowd into an extended celebration. I was standing at the goal line where Myrick scored, and could see the enormous hole open up at the other end. Myrick blazed through and never looked back, racing down the left sideline and into the end zone. 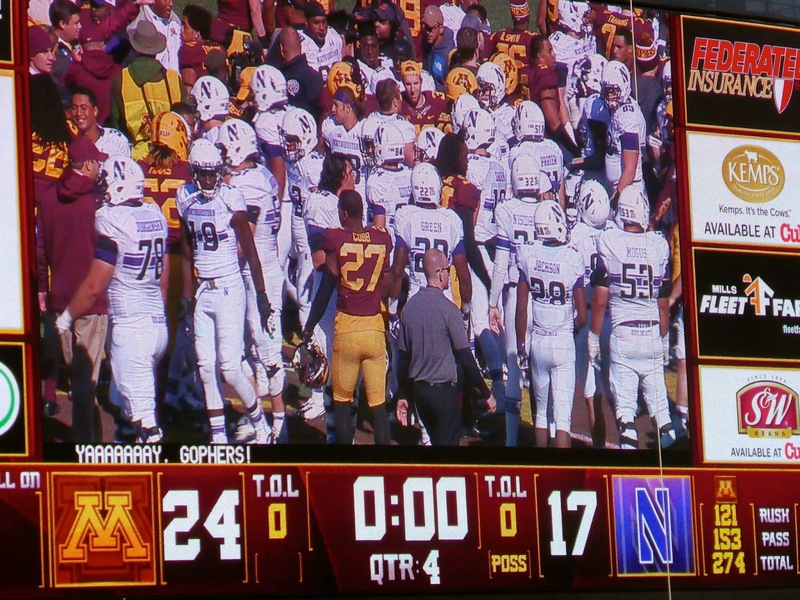 After that, Northwestern had two meaningful drives, and got to the Minnesota 33 on one of them before a 4th down pass fell incomplete as the Gophers held on to win 24-17. 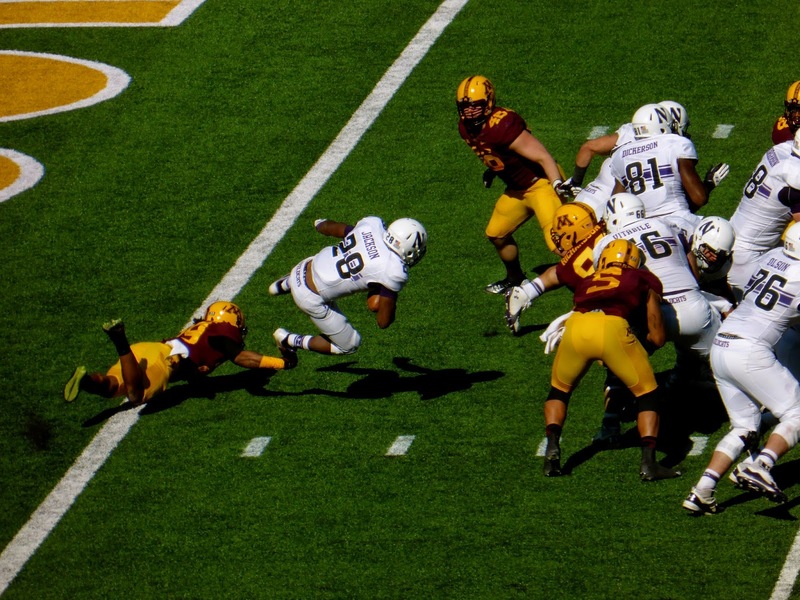 Despite running 30 less plays and being outgained 393-274, the Gophers emerged victorious, highlighting the importance of special teams and return yardage. This was the type of football game I like, where long drives are more common than the big play. Northwestern had two drives of 16 plays that resulted in their first half touchdown and field goal, along with their 13-plays touchdown. Minnesota had two drives of 11 plays resulting in 10 points; their other touchdown came on a 6-play drive that covered 75 yards. Sadly, I am in the minority in my preference for a 24-17 game than a 41-38 affair. Most football fans seem to like as many points as possible, as evidenced in this TMQ column. I like Minnesota's style and am hoping they continue to do well this season, showing the country that football is not all about flashy plays. The plan that evening was to watch a junior hockey game as the NAHL’s Minnesota Magicians were at home in Richfield, a southern suburb of Minneapolis. 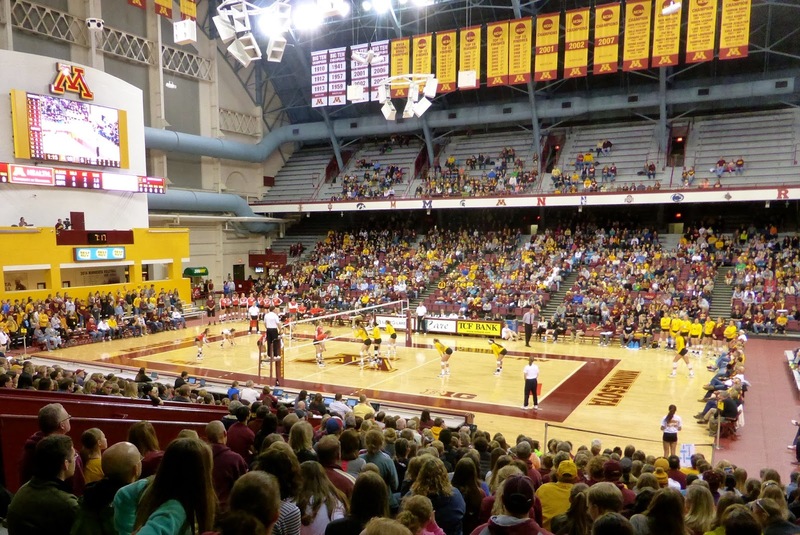 During the football game however, it was announced that the Golden Gophers volleyball team had a game that evening and those with a football ticket would be granted free admission. For a cheap Canadian, this was a dilemma. Did I want to drive 15 miles and pay $15 to see hockey, or walk 5 minutes and pay nothing to see women’s volleyball? The presence of several bars near the campus answered my question. We decided to hang out at Buffalo Wild Wings (a good postgame destination if you like large crowds) for a few hours and made our way to Williams Arena to watch the Golden Gophers take on the Scarlet Knights from Rutgers. There was a surprisingly large crowd of 3,300 fans already there as we found seats behind the court. 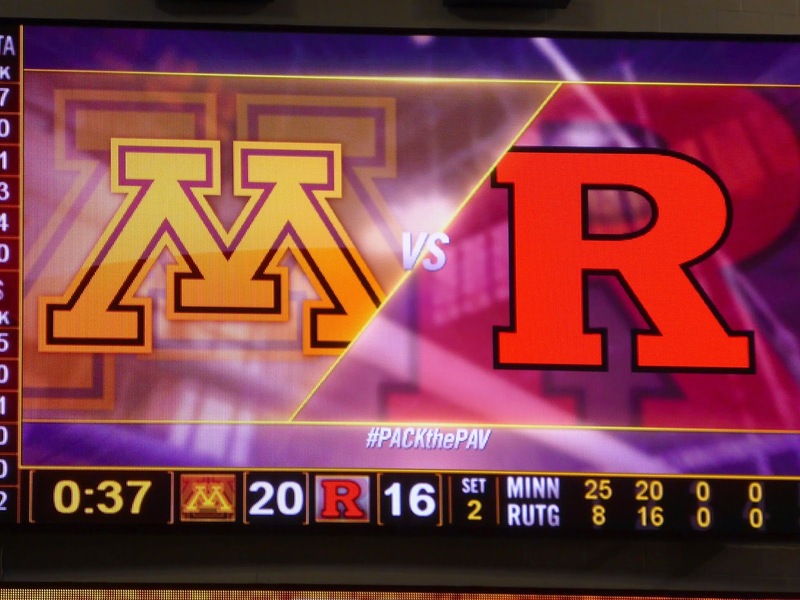 The match wasn’t close though, as Minnesota swept Rutgers in three straight sets. The entire event lasted just over an hour, but it was fun to see. I always enjoy when teams promote their other sports this way; Duke did the same thing last year when baseball ticket holders got in free to see the eventual national champion lacrosse team. Going forward, I’ll be checking out all the sports on campus to see if any other doubleheaders can be scheduled. Stay tuned to find out what trips will be planned in 2015.